In addition to internships, there are many other ways for students to engage in the scholarly world at Duquesne and elsewhere. Many students have their first chance to do so at the Graduate Student Research Symposium (GSRS) where they display posters and present papers about their work to an audience of faculty, students, and staff from across the university. 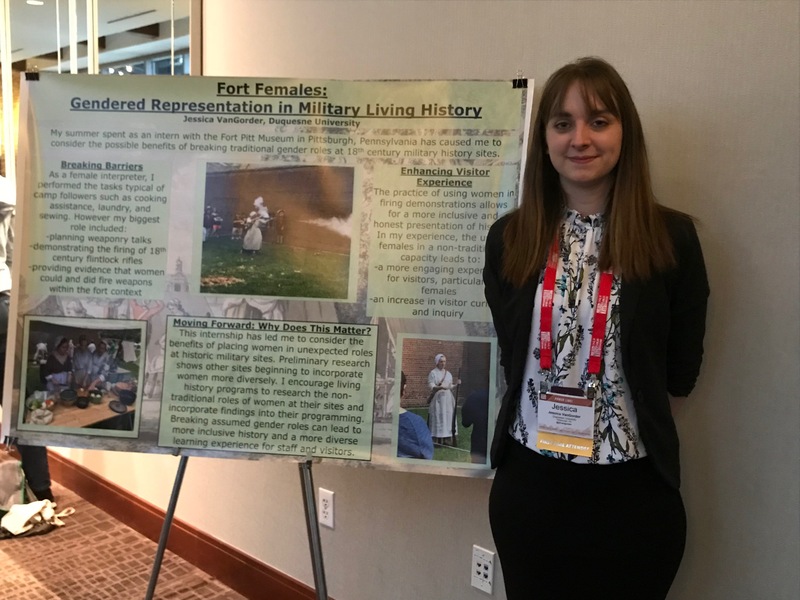 In 2015 the Department of History established the Clio Awards -- which give cash awards to the three best student papers or posters presented by graduate History students at the GSRS. In spring 2019 the Department of History will establish the Excellence in Graduate History Awards which give cash awards to the two best graduating graduate students in either the Public History and/or the Historical Studies programs. We also encourage students to continue developing and presenting their research at conferences such as the regional Phi Alpha Theta conference as well as national and international meetings of the National Council on Public History, the Oral History Association, Oral History in the Mid-Atlantic Region (OHMAR) and the American Historical Association. Students complete a number of additional Public History projects each year. They write National Historic Landmark applications, work on exhibition briefs, archive documents, learn new types of technology and coordinate exhibitions. In 2015, students worked with local prisoners to put on an exhibition called Art Beyond Bars and in 2017 students from Dr. Jennifer Whitmer Taylor's Speaking to the Past: Oral History in Methodology and Practice course collaborated on an oral history project documenting the Third Alternative, a student-led movement that raised money for Duquesne in the 1970s. We are also very fortunate to have the Drs. Steven Béla Várdy and Agnes Huszár Várdy International Research and Study Grant available to our students. This grant promotes international academic work and broadens students' global awareness by providing financial support to a leading graduate History student or Public History student doing research overseas. Top of Page: Assistant Professor of Public History Dr. Jennifer Whitmer Taylor and Public History graduate students prepare for their presentation at the 2017 Oral History in the Mid-Atlantic Region conference, held in Washington, D.C.